Easily Re-brand and reconfigure as your own product and sell to your clients. EZWebPlayer’s forte’ is all about you, actually— not us. What makes us unique in the Web Video Industry is that we don’t even WANT our name on your videos, unlike just about every other web video host. Nor do we force you to use a player that looks and operates like all of the other players out there. 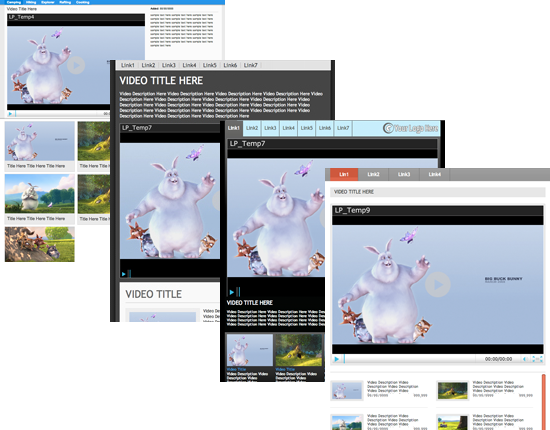 We want you to enjoy the luxury of crafting a video player that reflects YOUR design attributes and needed tools. -If your web site uses an executive looking plumb and grey color scheme, then your player should too. –If you want to limit your viewers to watch a 15 second video all the way through instead of scrubbing or pausing, then you should be able to remove the tool bar buttons, right? All of this, with YOUR branding, not ours. What happens AFTER your video plays is often more important than the video itself. Not all videos serve the same purpose. Some are connected to a CtA (call-to-action), some are purely informational and some are nothing but entertainment. So, the web player that they play in should have the appropriate buttons and actions available. If you want to post a 15 minute video of your wood stove's roaring fire and have it loop, then you should be able to do that. Or, make that endless loop be your store’s welcome video that informs of daily or weekly specials. How-to videos, menu items, photograph scrolling, real estate promos— the possibilities are endless. Upon page load, the video can automatically begin playing without your audience clicking a thing — or not. Make the video play again automatically— all day long, 24/7 if you like. Design the last few seconds of your video to be informational— maybe your contact info, and a part of your Call-to-Action. The video pausing here after video play makes a useful contact tool. Easily make the video unavailable with one click. Why, you ask? That’s up to you. But, it could be because the information in the video all of a sudden became inaccurate and it’s going to take you several minutes or a day or two to change it. 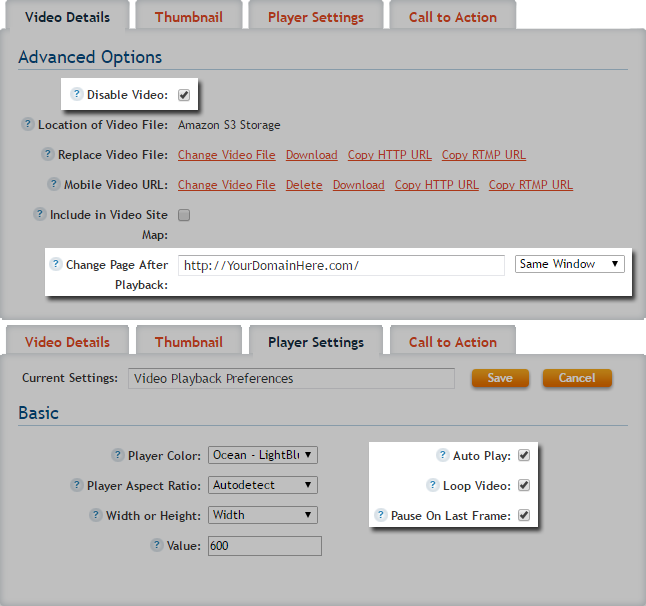 Disabling the video makes no other changes to your setup or web page. It just stops the video from being accessible. As soon as the video reaches its end, the web page that your audience is watching will change to ANY WEB PAGE. Not just any video, but any web page. You can imagine the power of showing your potential customer the very next thing that you want them to see as soon as the video ends play. Making the player your custom player goes way beyond simple design preferences of color and texture. 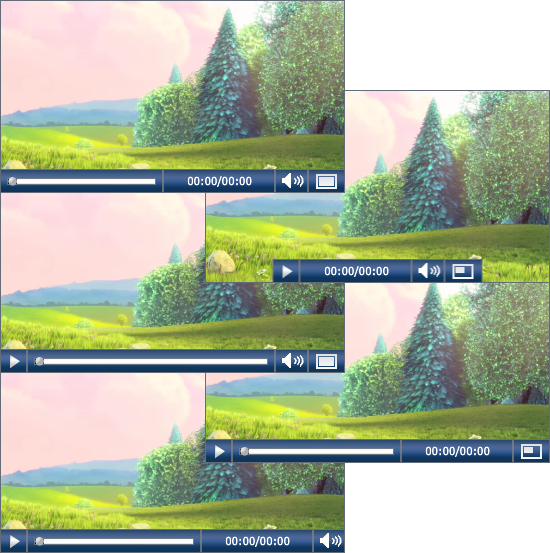 You want the player to automatically fit to the size and shape of your video, right? And, you want to maintain control of player options that you hand the audience, also. How your audience interacts with the video itself is largely decided by the controls you hand them. The Control Bar at the bottom of the player has buttons and bar for PLAY/STOP/PAUSE, SCRUB, VOLUME and FULL SCREEN. It also has the TIME STAMP display. You can choose any or all to display or not. The principal reason for this set of tools is to color match your design schemes so that your player fits seamlessly into your web site. 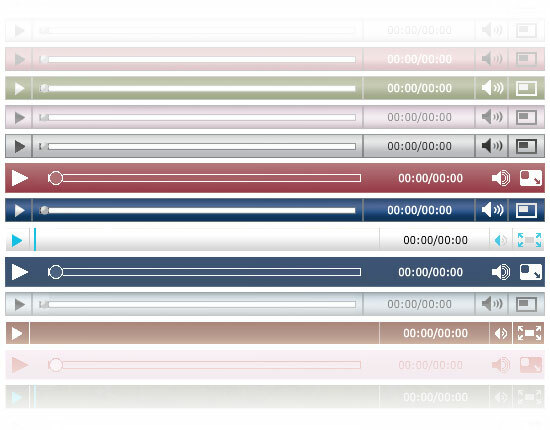 But, being able to pick the toolbar and colors of your video player seems like a no-brainer to us. After all, it is YOUR player, right? With just a few clicks and SAVE, you have a custom player. Many different schemes to choose from and that’s just for the tool bar. Make the player size and shape match your video. At-a-glance references are extremely convenient under appropriate circumstances. Have the title of the video file appear at the top of the video. The form gets the title information form your manually entered title in the Video Settings, or from the uploaded file name information itself by default. The conventional and quickly self-explanatory play icon is available center screen. Upon STOP or PAUSE the video thumbnail can appear in the upper corner of the video window as a reference. Very useful if the viewer pauses the video and comes back later to watch it, quickly being reminded of the video’s content. These advanced capabilities come standard on Pro, White Label and White Label Custom account levels. Your audience’s ability to choose videos from your other channels opens up a whole new horizon of sharing. Choose to allow video rating to keep your viewers engaged and to learn what to feed their interests. Let your viewers spread your Story by handing them the share codes of the current video for email, social media and embedding in their own site. Many viewers are still on the fringes of bandwidth capability. Allow them to watch your video with less bandwidth. The single web video is often not the product itself, but only an important part of marketing a product or service. Letting a video be the jumping off point for other media and web pages is an important part of web video marketing. Our Support Department works together with you and our Product Management Team to create your first Video Landing Page for free. Draw more viewers and enjoy more Calls-to-Action as well as greatly impact your SEO and LPO.